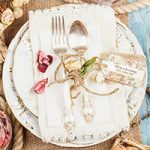 With so much stationery available, picking the right accessories for your wedding can be daunting! That's why Tree of Hearts has created a guide to wedding stationery accessories to inspire your own wedding day. Discover a range of ideas to suit your theme, whether it be traditional, modern, or quirky. One of the most important parts of the ceremony is the order of service. This lets guests know what is going to happen during the ceremony. It can contain different prayers or songs that you would like the guests to participate in, making the event even more meaningful to you. What's more, both you and your guests can keep them as a lovely memento of your special day. Featured design: "English Roses - Order Of Service Concertina"
To read more about planning your order of service, just click here! A table plan is essential for any wedding, guiding guests to their seats while also decorating the reception venue. They can be displayed in different ways, such as framed on a wall or sitting on an easel. 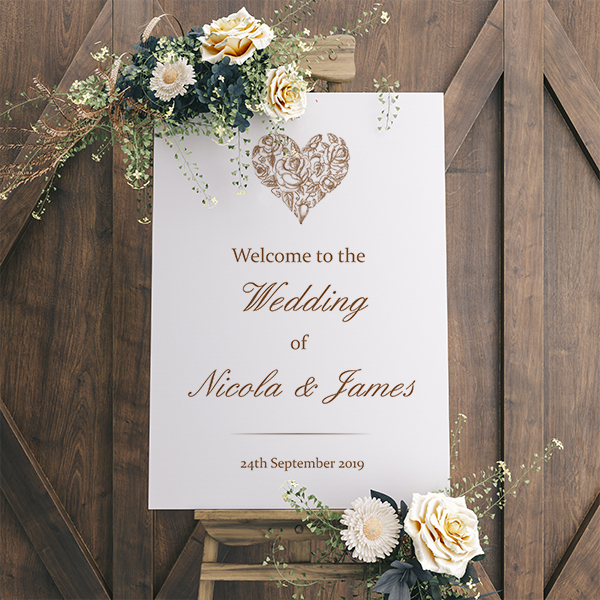 Although they can be displayed wherever you want, we think it's best to put them near the entrance of your wedding venue so can be seen by everyone. Want tips on how to plan the notoriously tricky seating arrangement? Check out our guide! If you want to match the impact of a table plan to guide guests through another part of your wedding day, try a wedding sign! They're great for displaying an order of the day, menu options, or even just your favourite quote about love! 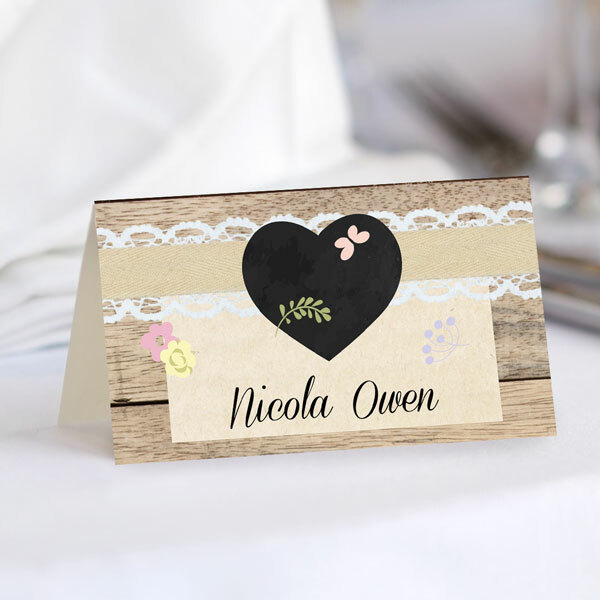 Featured design: "Amore - Wedding Sign Range"
Place cards help guests find their spots at your wedding reception and add a beautiful finishing touch to your table setting. You can use them for more than just locating your table - try adding menu options to the back. Featured design: "Pastel Chalkboard Flowers - Place Card"
Match them to the rest of your wedding stationery accessories to make your theme flow. Pair with table name/number cards to guide guests to their designated table in style. Create a fun personal twist by naming the tables - look to your favourite films, books, or celebrities for inspiration! If you have drinks available on the table at your wedding, wine bottle labels add a fun twist to the bottles. 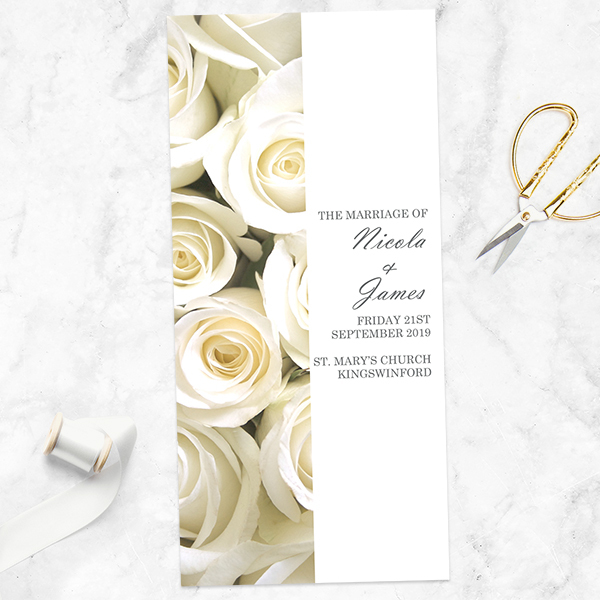 Pair them up with the rest of your wedding stationery accessories to complete the look. Wine labels aren't the only accessories available for wedding refreshments. Drink tokens treat guests to a free drink without going for an expensive open bar - and they look great, too! You can also read more about wedding bar etiquette here. Luggage tags are an affordable and versatile accessory. Tie them around cutlery to make a place setting stand out. What's more, you can also tie them around wedding favours to deliver a sweet personalised message. Featured design: "Shabby Chic Heart & Flowers - Favour Tag"
Alternatively, pair them with a wishing tree - a fun twist on the classic guest book. Give your guests tags so that they can write a note and hang them on the branches. It's a wonderful keepsake you can look back upon it for years to come! Guest books are a wedding tradition, letting guests leave a message for the happy couple. But if you are looking for a quirky alternative, try a fingerprint tree! Fingerprint trees give your wedding a more personal feel and leave you with a lovely keepsake. Simply choose different coloured ink pads and let guests create a piece of art that matches either your wedding theme or your home. Great fun for guests both young and old! 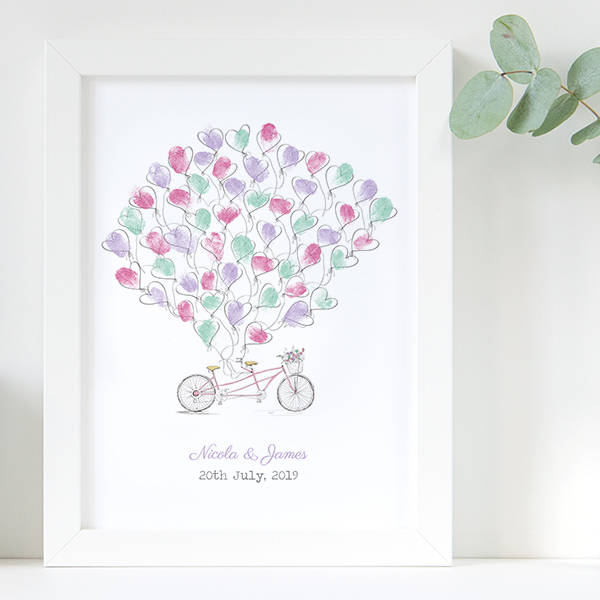 Featured design: "Vintage Tandem - Guest Signing Print"
If you want more unique guest book inspiration, click here!